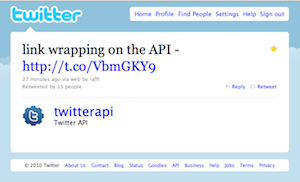 Today, Twitter has expanded the testing of its own URL shortner — which is now using the t.co domain. The expansion (which will eventually be available to all Twitter users) is interesting in terms of what it means for the URL shortening ecosystem. But it also should be interesting from a broader perspective to the entire ecosystem because it opens up some new possibilities, such as content recommendation. Twitter developer Raffi Krikorian notes as much in the Twitter Development Talk Google Group today. Specifically, he writes, “we want to be able to build services and APIs that can make algorithmic recommendations to users based on the content they are consuming.” This will be possible because Twitter will be keeping track of all clicks (as they note, “in aggregate and not identifiable manner”). Since they’re tracking these links, Twitter will be able to provide app developers with this data as well. This is obviously a direct assault on Bit.ly — but the content recommendations also seems to be going after the still-unlaunched Bit.ly Now service.